The law firm of Johnson, Carroll, Norton, & Kent P.C., has provided quality legal services in Evansville and southwest Indiana since 1952. As a full-service law firm, we are able to meet many needs, from insightful estate planning for future scenarios to confronting urgent legal matters. The attorneys of our law firm have more than 125 years of combined experience. They each practice in focused areas of the law, enabling us to provide counsel and litigation in a broad spectrum of legal matters: wills and estate planning, elder law, estate administration, divorce and family law, business consulting and litigation, real estate law and criminal defense. We serve individuals, families and businesses in communities of Vanderburgh County, Posey County and Warrick County. As an established and trusted presence in the Evansville area for nearly 60 years, we are proud that many longstanding corporate clients and many second- and third-generation family members turn to our law firm for sound advice and effective, cost-conscious representation. Johnson, Carroll, Norton, & Kent P.C., is a small enough firm that clients receive personalized attention and ready access to an attorney, yet large enough to fully meet the needs of our clients. Our highly trained support staff and state-of-the-art research and case management technology enable our attorneys to provide both old-fashioned service and 21st century legal advocacy. To arrange an appointment to address any legal matter, contact our firm at 812-205-2661 to schedule an initial consultation. Our Evansville law office is located three blocks from the expressway, with ample parking and first-floor accessibility. Johnson, Carroll, Griffith & D'Amour, P.C. 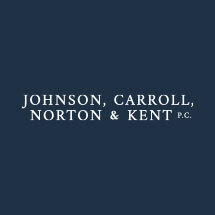 Johnson Carroll Norton & Kent, P.C. A will is an important document that protects you, your loved ones and your families' assets in the event of death. Estate planning does not have to be expensive, but it does need to be thorough. The law firm of Johnson Carroll Norton Kent & Straus helps senior citizens and their family members take steps to preserve family wealth, while also preserving eligibility for public benefits. Family law is one of the most contentious areas of the law. The financial, legal and logistical issues of divorce and child custody can be complex, and emotions and resentments can escalate disagreements. The divorce lawyers of Johnson Carroll Norton Kent & Straus provide strategic legal counsel for the nuances of contested divorce. Based in Evansville, we practice in family courts of Vanderburgh, Posey and Warrick counties. If you are charged with a crime or a serious driving offense, you need a lawyer who will stand up for you to fight the allegations or mitigate the consequences.